This article is about grow bags, what is the advantages , price and from where we can buy the same. It’s a large plastic bag and we can use it as a growing medium for growing plants. 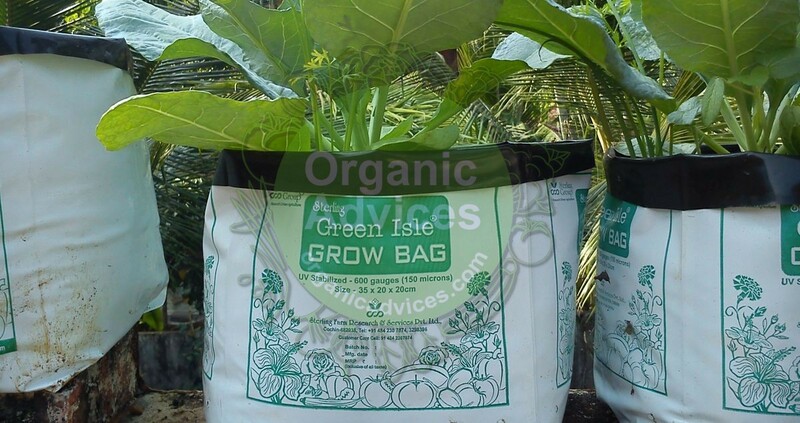 Grow bags are normally plastic bags with thick gauge. We have already wrote about Grow bags in malayalam at krishipadam.com, you can read about the same from here. The main advantage of grow bags are we can use a single grow bag upto 3-4 years. That means we use again a grow bag once the veggie is finished its life. We need to fill the grow bags with soil, peat, coir, composted green waste, composted wood chips, or a mixture of all of these. We need to mix organic fertilizers like dry cow dung, neem cake, vermi compost etc with the soil to ensure the growth of the plant. we can plant almost all the veggies in growbags. Its better to plant single plants in each growbag, but you can grow multiple number of small veggies like spinach. If you are using peat as the growing medium you can save water and can limit the watering. In which size these grow bags available? ?